The MURR Archaeometry Laboratory encourages scholarly research and academic development a top priority. As such, we welcome opportunities to collaborate with the bright young students from across the globe. 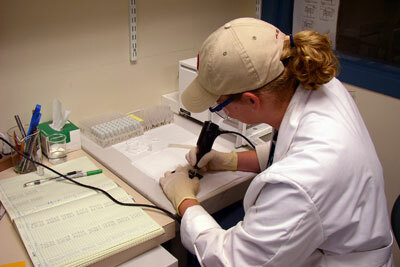 Since 1988, the Archaeometry Laboratory has provided analytical services for a large number of students pursuing graduate degrees in chemistry and archaeology. In addition, the lab regularly trains undergraduate and graduate students, and operates an internship program for graduate student. The Archaeometry Laboratory supports visiting graduate-degree candidates in anthropology, archaeology, or related fields for periods of 6–8 months. Applicants must be graduate students from colleges, universities, and institutes. The purpose of this program is to provide exceptional students with an opportunity to include archaeometric analysis in their dissertation research projects. Besides access to neutron activation analysis, the laboratory has gamma–ray detector systems, sample grinding equipment, petrographic microscopes, ultrasonic disaggregation equipment, a programmable furnace, and a variety of computing facilities. Other analytical equipment includes a quadrupole ICP–MS system with laser ablation system and multiple energy-dispersive XRF spectrometers. Projects appropriate for the program include chemical and petrographic characterization of pottery, chemical sourcing of obsidian and chert, and selected studies of other material types. Participants will receive guidance in all aspects of the analysis and interpretation of data. Participants will have access to analytical equipment, computers, and office space. Certain expendable supplies must be paid for out of other funding sources, at costs ranging from $20–$40 per specimen. The Archaeometry Laboratory occasionally plays host to scholars and researchers. Some researchers provide informational lectures to the staff and students of the laboratory and of MURR. Others come to discuss collaborative research projects or to learn how to analyze compositional data. Still others, particularly graduate students, travel to MURR to assist in the preparation, analysis, and interpretation of specimens for their own research projects. Research performed by the Archaeometry Laboratory at MURR after August 2016 is supported by the National Science Foundation under our current grant number 1621158. Earlier research was supported by several NSF grants including the following: 1415403, 1110793, 8801707, 9102016, 9503035, 9802366, 9977237, 0102325, 0405042, 0504015, 0802757, 0922374, and 0802757. Any opinions, findings and conclusions or recommendations expressed in this material are those of the authors and do not necessarily reflect the views of the National Science Foundation.